March 23rd, 2019 Victoria, BC. 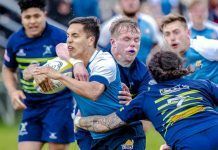 (ISN) – The UBC Thunderbird men’s Premier division rugby team dominated the tenth place James Bay Athletic Association Bays , running away with a 54 -13 lopsided win Saturday afternoon at MacDonald Park in Victoria, BC. For UBC, their twelfth win of the regular season, the victory puts them atop of the premiership standings with 62 points, and one bonus point ahead of the Castaway Wanderers who also feasted in a point-fest Saturday, beating Nanaimo 66-19, and nipping at the Thunderbirds heals for top spot as the regular season begins to wind down with three weeks remaining. With the return of national team member Luke Campbell and Josh Theil added to the JBBA mix, hopes were high for a strong finish the remaining few games of the season despite being out of playoff contention. UBC, after taking advantage of Capilano last weekend in a 67-12 win, looked to hold onto, if not improve their play and their standing with a playoff bye available for their taking. James Bay, would hit the scoreboard first, the early benefactor of a penalty conversion, to take their only lead in the game. UBC would rattle off three successive trys after the Bays score early in first half to take a 21-3 lead. James Bay’s, Alex Jordan would take advantage of poorly handled UBC ball, carrying it from midfield to score his team’s only try in the game. James Bay would appear to slow UBC’s momentum late in the first half, creating turnovers that would put ball control in the home team’s advantage, temporarily halting UBC’s scoring success. Another penalty kick late in the half would let James Bay pull closer 13-21 to end the first frame. Able to reset after the break, UBC would continue their early first half dominance, scoring five trys while holding James Bay off the scoreboard in the second half, on route to the UBC 12th win of the season.